These were the FRE's favorite until I improved my use of Halloween decorations for baked goods. 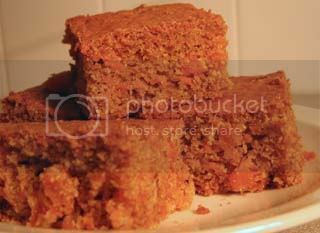 (See Butternut Squash Squares.) But I would wager he still ranks these high, especially the ones I made with fresh cranberries over the holidays (just add 1/2 cup fresh cranberries to the batter). If you like the color orange, these are for you. The carrots, apricots, and orange juice conspire to create a confection that would do FD&C Yellow No. 6 proud, except the color of these squares come from all-natural carotenoids. Try one. They're low-fat, fiberful, contain no white flour, no granulated sugar, and serve up fair amounts of the antioxidants beta-carotene, alpha-carotene, lutein, zeaxanthin, and beta-cryptoxanthin. Your eyes, hair, skin, and taste buds will thank you. 2 Rub 1 tsp. vegetable oil on the insides of an 8 by 8 inch cake pan. Note: I've also used an 8 by 4 inch loaf pan with good results. 3 Combine the orange juice, lemon juice, oil, honey, and rice syrup. Whisk or beat vigorously until fully blended. Stir in the carrots and apricots. 4 Stir together the first 9 ingredients (dry ingredients). 5 Whisk the egg in a small bowl. Add about 2 tbsp. of the liquid ingredients to the whisked egg and beat. Slowly pour the beaten egg back into the liquid batter, whisking the batter as you pour. 6 Add dry ingredients to wet. Fold in slowly until just combined and no dry lumps remain. Pour into prepared 8 by 8 inch pan. Bake at 350°F. for approximately 45 minutes or until a toothpick inserted into the middle comes out clean. 7 Cool thoroughly (1 to 2 hours) in the pan before cutting into squares. They may be eaten then or stored in the freezer.